Renovating the bathroom of a commercial building is no easy task. In the U.S., public showers must be compliant with the Americans with Disabilities Act (ADA) and able to accommodate mobility-disabled users, including wheelchair users. Oklahoma Bath Pros helps you easily meet any ADA shower specifications with our low-cost, high-quality ADA roll-in shower units and installs. 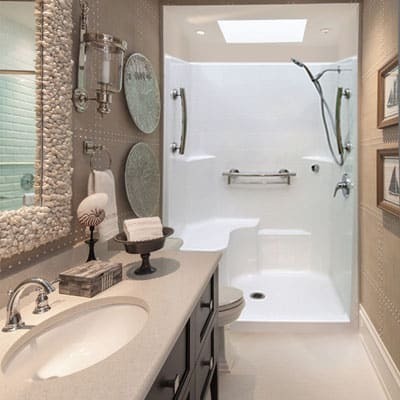 If you are researching remodeling or new construction projects‚ especially for bathrooms‚ you will likely come across the terms “ADA compliant” and “Accessible.” It is important to understand the difference before deciding what you need for your project. ADA stands for The Americans with Disabilities Act which is a civil rights legislation enacted in 1990 to prohibit discrimination against people with disabilities. The act requires that any public or commercial building in the U.S.‚ complies with ADA requirements. ADA usually does not apply to private residences. Make maneuvering in a wheelchair easy, with 60″ x 30″ of accessible shower space. Some jurisdictions require a 60″ x 36″ inside dimension so that caregivers can easily assist. Specially designed so that users can transfer onto a shower bench from a wheelchair parked outside the shower unit. To comply with ADA requirements, ADA Transfer Showers must be properly accessorized. Accessible Showers share some of the features that ADA compliant showers have, but they are designed for residential use. There are rarely code compliance requirements for residential use, so you can choose from many different sizes and styles. For an ADA compliant shower, the shower stall must be barrier free with a beveled curb no higher than ½”. Otherwise, the curb must be flush with the bathroom floor. Handicapped accessible shower floors are textured for additional safety. Oklahoma Bath Pros carries a large selection of code compliant ADA Handicapped Showers, ADA Roll-in Showers, and ADA Transfer Showers. If you are a commercial or public building operator planning for current or future accessibility needs, call our expert customer service team to experience the high-quality, customizable options in ADA compliant bathrooms, Transfer & Roll-In shower stalls.